Technology leadership - how to produce a real value product recommendation system for your customers with Artificial Intelligence and Data Mining. SDART has been approached by representatives of the NTT Group with a request to consult and suggest future directions for their technology development. NTT Group is managing all area of telecommunication and ICT business. This includes the mobile operator NTT DOCOMO. It also has some financially consolidated arms in EMEA such as Dimension Data and Cirquent. The EMEA financial representative office of Japan's NTT (Nippon Telegraph & Telephone) Group contacted us with a request for a concept solution for an intelligent mobile assistance service. The aim for the project was to discover new possibilities in particular regarding the improvement of their CRM (customer relations management) strategy used by the current “I-concier” system. The main focus was concentrated on the possibility of developing a new intelligent service that would offer real value suggestions and assistance to the customer. We selected the most relevant Data Mining processes. 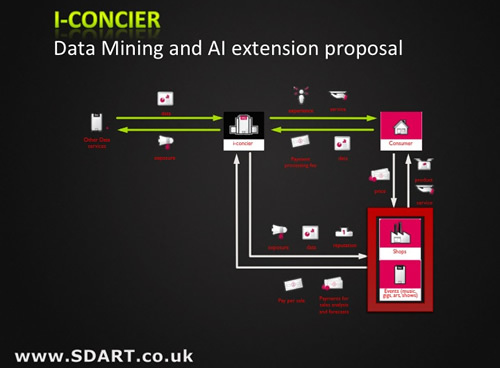 SDART created a detailed concept vision and explanation of the possible applications of the mobile advisory system (I-concier example). Also included was an explanation of the advanced Data Mining strategy that should be applied for successful customer profiling and recommendation processes. The planed enhancements of the systems functionality had to stay in line with the business-defined objectives. The technical advantage was to be achieved by delivering a sophisticated recommendation algorithm based on a flexible functionality of the system and various data sources and predictive modeling of the customer.